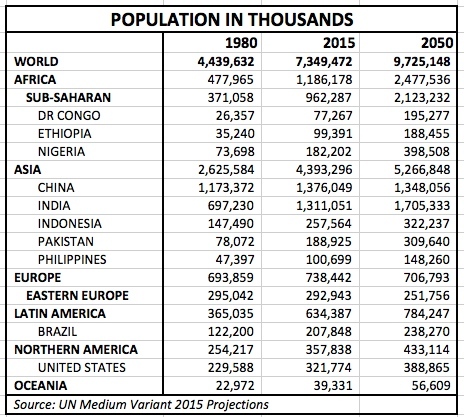 On UN projections between 2015 and 2050, the world population will grow by nearly 2.38 billion people, from 7.35 billion to 9.73 billion. Although this 32% growth is a big increase, it marks a slowdown from the 66% growth rate recorded in the preceding 35 years (1980-2015). Total Fertility Rates (TFRs) have come down all over the world and are expected to continue falling. Boeing has a better product lineup and is more profitable but Airbus has more room for improvement. The rising tide of globalization has boosted growth prospects for the airline industry all over the world, and in particular in emerging markets such as China and India. As air travel has become more accessible to hundreds of millions of people, airplane orders and deliveries have boomed. We examine the evolution of orders and profits at Boeing and Airbus. Given the Boeing – Airbus duopoly and buoyant demand markets, both manufacturers should now be highly profitable but this is only true of Boeing. Airbus made some strategic decisions in the late 1990s and early 2000s that continue to depress its profitability, namely the development of the super jumbo A380 which is still loss-making, and the sale of planes below cost or at razor-thin margins in the early 2000s in a drive for market share. If Airbus’s main mission has been to gain market share, one has to recognize that this mission has so far been highly successful. In the year 2000, Airbus delivered 311 planes to airlines and Boeing delivered 489. Eleven years later in 2011, Airbus delivered 534 planes and Boeing 477. As important, the backlog at EADS (European Aeronautic Defence and Space Company, the parent of Airbus), including non-Airbus divisions, grew from €132 billion in 2000, the equivalent of 5 years of revenues, to €541 billion in 2011, the equivalent of 11 years of revenues. Boeing’s comparable backlog grew from $153 billion in 2000, 3 years of revenues, to $355 billion in 2011, 5 years of revenues. Because the Euro has appreciated against the dollar in that decade, these figures actually underestimate the scale of the shift in favor of EADS/Airbus. In dollar terms, EADS’s backlog has grown from $124 billion in 2000 to $700 billion in 2011, a near six-fold increase. But Boeing has been more profitable. In 2011, its EBIT margin in commercial planes was 9.7% vs. 1.7% at Airbus. This dichotomy between one party’s push for market share gains and the other’s focus on profitable orders has defined the relationship between the two competitors for over a decade. In a decade of astounding revenue and order growth, Airbus has not improved its profitability. In fact, its operating income (EBIT) was negative in three of the last six years (2006-2011) despite healthy revenues and deliveries. Boeing has remained profitable but its commercial airplane sales and operating income have been range-bound for a decade. From 2000 to 2011, Boeing sales grew at a small 1.4% annualized rate and EBIT at only 2.3%. At Airbus, sales have grown at a 7.6% annual rate (11% in dollar terms) but EBIT has nosedived into the red for the past six years. Boeing’s commercial plane division accounted for 66% of its group sales in 1999 and now accounts for 52%. Airbus sales have remained consistently above 60% of EADS group sales and reached a new high of 67% in 2011. Airbus’s drive for market share at the expense of profits has had a very measurable impact: its revenues are up, its profits are down, and Boeing’s airplane sales and earnings have flatlined. EADS went public in July 2000 at €19 per share and ended 2011 near €24, a subdued performance for an 11-year period in which sales more than doubled. In January 2012, Airbus promised better returns for its shareholders for the years ahead and the share responded by rising to €31 in March (it recently traded at €28.8). EADS’s reasons for optimism are a decline of the Euro vs. the US dollar and a long-awaited improvement in operating margins for its superjumbo A380. Long-term headline prospects look nominally encouraging. Airbus and Boeing estimate that 25,000 to 33,500 new planes (including both passenger and cargo) will be delivered to airlines in the next twenty years. However, according to Boeing, single-aisle aircraft (the A320 for Airbus, the 737 for Boeing, and their successors) will account for two thirds of units sold and for half of the value. And as many as one third of new planes will be sold in the Asia-Pacific region. As a market segment, ‘single-aisle in Asia-Pacific’ is not the ideal sweet spot for profit growth because smaller planes have lower margins and because Airbus and Boeing face new entrants in the single-aisle category, notably from China’s COMAC C919 and from Russia’s Sukhoi Superjet 100. The COMAC C919 seats 165 to 190 passengers and is therefore directly positioned against the larger versions of the A320 and the 737. It already has 175 orders, nearly all from Chinese airlines, and it plans to start deliveries in 2016. Note in passing that Airbus is now assembling some of its own A320s in Tianjin, China, with a target production rate of four per month in 2012. It says on its web page Airbus in China that it “has several major technology transfer programmes underway” some of which have ostensibly already been filtered to COMAC. The Superjet 100 is smaller than the C919 at 75 to 95 passengers and is positioned against the smallest versions of the A320 and 737 and against Brazil’s Embraer and Canada’s Bombardier. Although it has 240 orders, there are only eight in service now, seven of them with the Russian carrier Aeroflot. Last week’s tragic crash in Indonesia raises fresh safety concerns about Russian aviation just as it tries to rebound from its accident-prone Soviet legacy. Turning to recent orders, we see that as of the end of April, Boeing had received 415 new plane orders in 2012 and Airbus 95. This huge lead in favor of the American is a temporary anomaly because most of it comes from orders for the new Boeing 737MAX which came on line about 12 months after the competing Airbus 320NEO. If 2012 is the year of the MAX, 2011 was the year of the NEO with Airbus logging a commanding 1419 total orders (of which 1226 for the NEO) against 805 at Boeing (of which 150 for the MAX). Looking at wide-body categories, the Airbus lineup includes the A330, the A340, the perennially loss-making superjumbo A380, and the A350 still under development. Boeing’s competing lineup includes the aging but ever-updated 747, the 767, the new 787 ‘Dreamliner’, and most importantly today, the hugely successful 777. Stripping out single-aisle aircraft from 2011 orders, we see that Boeing secured 254 orders for wide-bodies and Airbus 193. The 777 in particular now enjoys a quasi-monopoly in some segments, vindicating Boeing’s decision to develop this plane while Airbus exhausted itself on the prestige-minded A380 double-decker. Boeing delivered its 1,000th 777 to Emirates in March. Airbus has positioned different versions of the upcoming A350 against both the 777 and the 787 Dreamliner. The A350 is years away from service but it now has a total of 548 orders. Recent cancellations by Abu Dhabi-based Etihad Airways have slowed down the momentum for the largest version A350-1000 which competes with the 777-300ER. Airbus still loses an estimated €30+ million on each A380 that it builds but it expects the program to break even in 2014-15 on an EBIT pre R&D level, which is break-even on an operating level, ignoring much of the upfront investment. That would place the EBIT break-even point somewhere between 200 and 250 unit deliveries (so far 72 A380s have been delivered). In 2005, Airbus estimated the program would break even on an IRR basis at 270 units. But in 2006, it revised the break-even point to at least 420 units. The A380 now has 253 orders, two thirds of which have come from airlines based in emerging markets. And one airline, Dubai-based Emirates, accounts for 90 orders. Airbus sees a total market of over 1,200 units for the A380 (all versions) in the next 20 years, but Boeing believes the potential market is only 325 units. Depending on where one stands on either end of this range, the A380 will either be handsomely profitable in a few years or one of the most visible financial failures in modern industry. For context, consider that in the 42 years since the introduction of the Boeing 747 in 1970, Boeing has sold nearly 1,500 versions of the plane. With its A380 projections, Airbus is hoping to sell 80% as many units in as few as 20 to 25 years. It is true that the overall market is much bigger today but it is also true that airlines seem more interested in smaller planes. Rising world demographics do not necessarily create a correspondingly large demand for jumbo planes, as much as they do for a larger number of destinations and higher frequency of flights serviced by smaller aircraft. It would be beneficial for both manufacturers if the A380 turned a profit (at least at EBIT level). The plane has a list price of $375 million but list prices are generally above contracted prices. Boeing’s revamped 747, the 747-8 Intercontinental, has a list price of $318 million. If the A380 stays in the red, the question becomes how long will Airbus continue to build it at a loss? Thousands of European jobs depend on the plane and Airbus will probably keep the program for as long as possible. Selling the A380 at a loss for an indefinite period would be detrimental to the Boeing 747-8’s own profitability if Airbus has to offer greater and greater discounts in order to keep the program alive. It is still early in 2012 but both manufacturers have had difficulty selling wide-body aircraft this year. Of Boeing’s 415 net orders, only 2 were for wide-bodies (there were 8 new orders and 6 cancellations). Of Airbus’ 95 net orders, only 6 were for wide-bodies (there were 22 new orders and 16 cancellations). The A350 has lost a net 7 orders in 2012. Boeing’s newest plane, the 787 Dreamliner lost a net 6 orders. However, both manufacturers have large backlogs, equivalent to 5 years of 2011 revenues at Boeing and to 11 years at Airbus, which should keep their factories humming in any downturn, barring large cancellations. Airbus is trying to improve its poor profitability. Its EBIT margin in 2011 was a dismal 1.7% vs. 9.7% at Boeing’s Commercial Airplanes division. Airbus management is targeting an EBIT margin of 10% for 2015, a level last reached in 2005. The margin is expected to start expanding in 2012 as A380 losses subside and low-margin orders from the early 2000s are finally phased out. By contrast, there may not be a lot of room for margin improvement at Boeing. Its group EBIT margin was 8.5% in 2011 and its margin in commercial planes was 9.7%. Long-term expectations remain high and both manufacturers are likely to add more capacity in coming years. Because these expectations are predicated on continued growth in emerging markets, a cyclical downturn in these markets will depress utilization rates and put pressure on pricing at the same time that new competitors enter the lower end of the market. On the other hand, continued expansion of emerging market airlines and operational improvements at Airbus could result in better pricing power unless COMAC manages to gain significant market share. In conclusion, both companies stand to benefit or suffer from emerging market developments. Operationally, Airbus has more room to improve. If it can narrow the margin gap with Boeing, EADS’s EV/Sales and stock should rise correspondingly. But its manufacturing location in Europe may make it difficult to reach its stated margin targets.